The Dolomite massifs around this short (8 kilometers, 583 elevation meters) ascent are impressive, with to the left and in front Monte Cristallo, with to the right and in front the Sorapìs and with to the left behind the cyclist the Tofane. Too bad that these mountains are often not visible because the road leads through forests or inhabited areas. Also too bad that traffic is that dense and that the street is that wide. 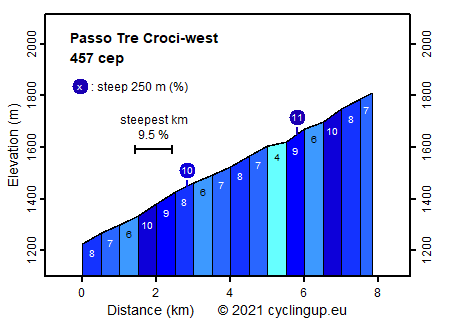 The profile of the climb is quite uneven. The road is nowhere over long distances steep or only gently sloping. The steepest kilometer (9.5%) starts after one and a half kilometers of cycling, at the end of the village of Alverà. Just after the parking lot of the chairlift Rio Gere - Son Forca, more than a kilometer before reaching the pass, lies the beginning of another relatively steep 500-meter interval (10%).